2. 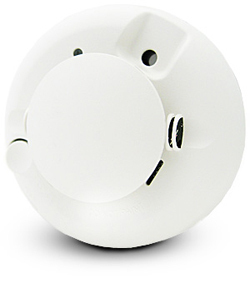 They can alert occupants on a different floor of smoke if there is a smoke detector and adequate sirens on each level. For example, a problem in a basement can cause a siren on the third floor to sound. 3. They notify the alarm company’s monitoring facility to dispatch the local fire authorities, even when you are away. These, and all smoke detectors, need to be tested and serviced regularly, a minimum of once a year. 4. They use the alarm panel’s main back-up battery in the event of a 110 AC power failure. Many insurance carriers offer a 5% to 20% discount on insurance premiums, offsetting the initial cost of the smoke detectors.